IRS published Notice 1036, Early Release Copies of the 2015 Percentage Method Tables for Income Tax Withholding. 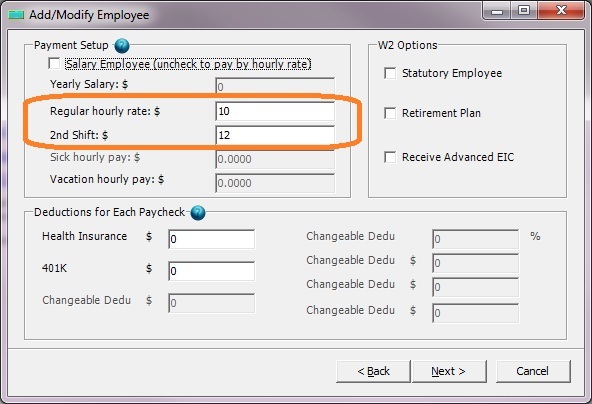 Here are some majors changes an employer should know for Year 2015 payroll processing. - For social security, the tax rate is 6.2% each for the employee and employer, unchanged from 2014. - The Medicare tax rate is 1.45% each for the employee and employer, unchanged from 2014. There is no wage base limit for Medicare tax. The new standard deduction for each dependent is $4000.00, which was $3950.00 in 2014. You can view 2015 Payroll Income Tax Withhold Tables here to see tax brackets changes and more details. Why is there no federal withholding taken out of my paycheck? Question: I have an employee. She is single with 3 allowances for federal tax withholding. She is paid at $21.79/hour and 21 hours per pay period. We paid her twice a month. 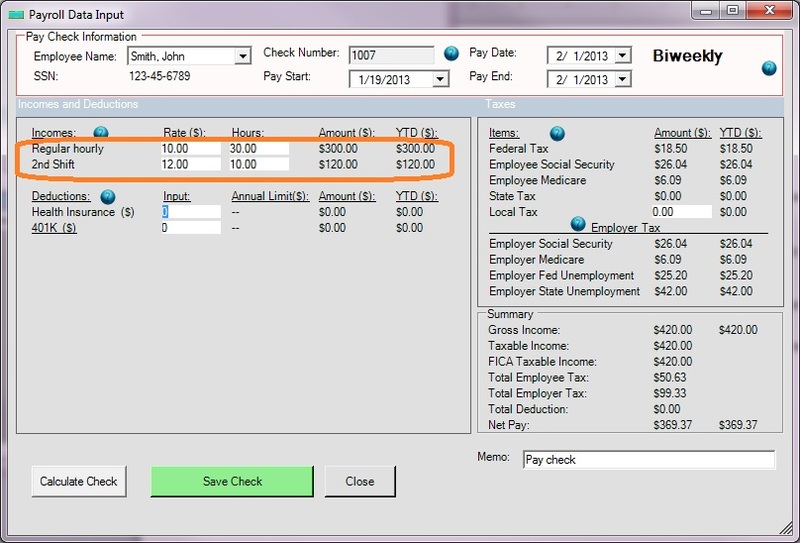 I used your ezPaycheck payroll software to generate the paycheck. However, I find $0 federal tax withhold on her paycheck. Is it correct? Why? Answer: Your employee can claim allowances on the W-4. Each allowance will lower her taxable income. The more allowances she claims the less federal income tax she pays; the less she claims, the more federal tax she pays. For your employee, her taxable income is not high enough to withhold federal tax. Here are the step by step calculations. So for this employee, her taxable income is $0. So you will see $0 federal tax on this paycheck. I can't find a payroll that will work for drivers paid by percentage. My Drivers percentage is done by the load and then the job. Some companies I pay higher percent than others but it’s all done by each load. EzPaycheck cannot calculate payment by percent automatically. However, the non-regular Wage item can help user handle it. 1. 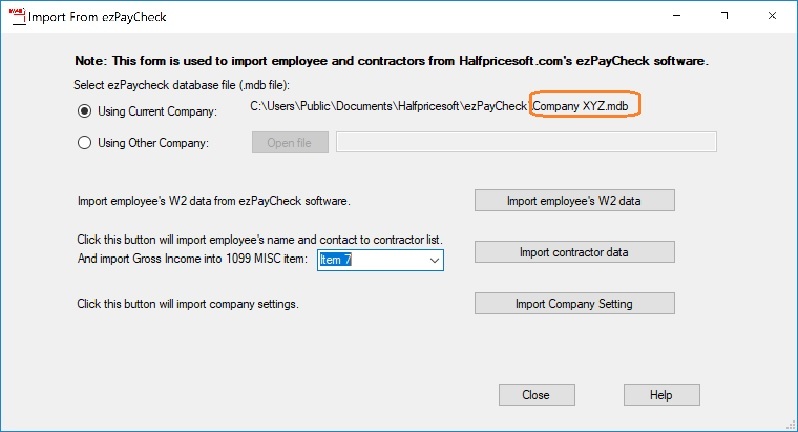 Start ezPaycheck payroll software, click the left menu "Company Settings->Wage Setup" to open Company Wage Setup screen. 2. Add two new payment type "Pay by Load" and "pay by job". Save the change. 3. 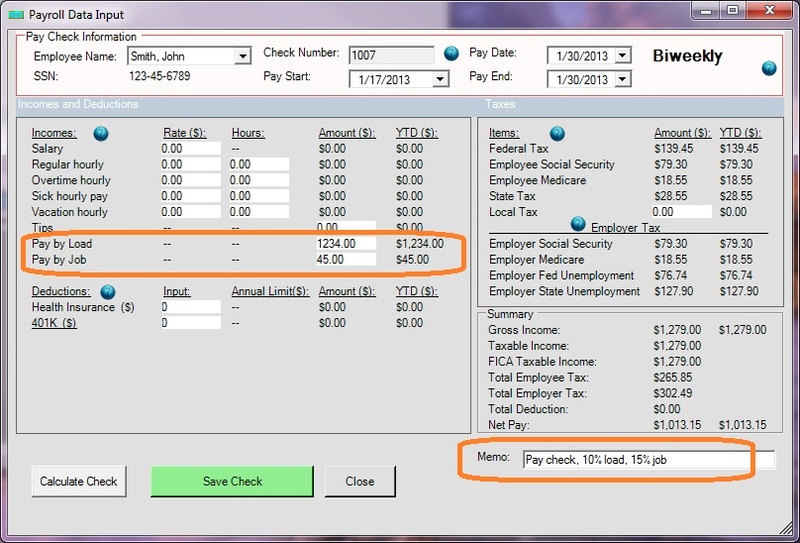 When add a new check, enter the Pay by load amount and Pay by job amount, ezPaycheck will calculate the taxes automatically. 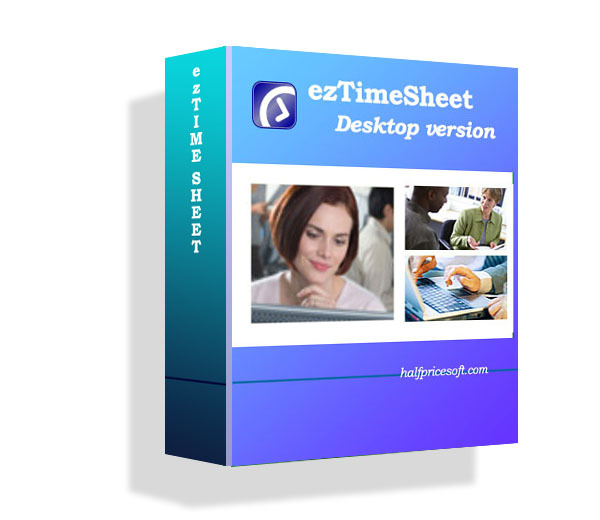 EzPaycheck users who need more controls on W2 form printing can try ezW2 software too. - ezW2 can print ALL W-2 forms (copy A, B, C, D, 1 and 2) and W-3 forms on plain paper. The black and white substitute forms of W-2 Copy A and W-3 are SSA-approved (Vendor ID: 1335). - ezW2 can print W2 recipeint copies in 4-up formats. It can also print 2 red forms on the same sheet. 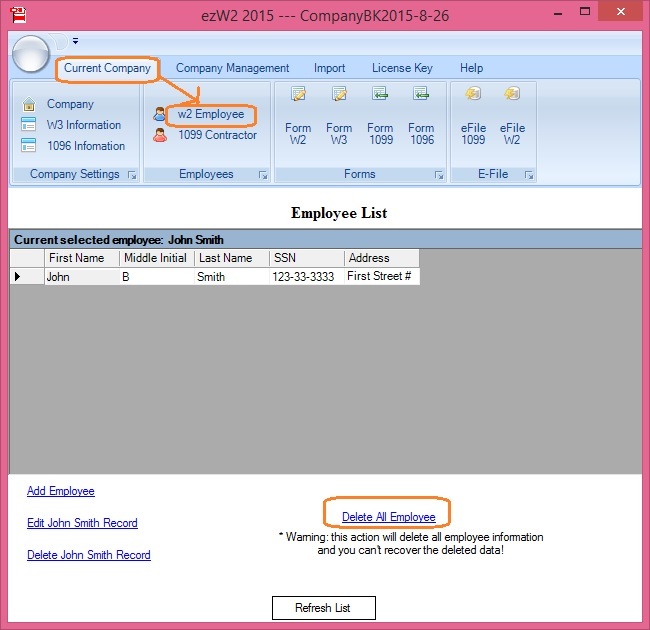 - ezW2 can print 1099 misc forms Copy 1, 2, B and C on white paper. IRS does not certify the substitute forms right now. 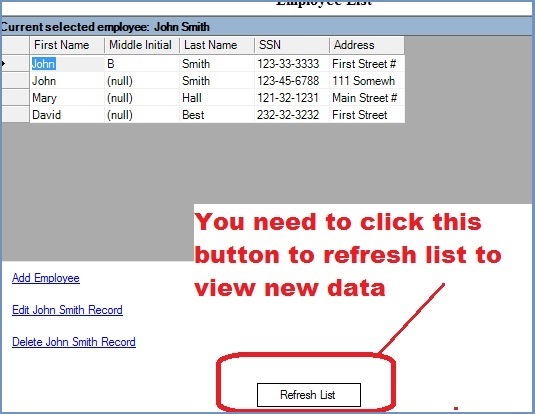 You need to use the red-ink forms for 1099 MISC copy A and 1096. - ezW2 also supports PDF and efile features. 2. start ezW2 software, click top menu "Import From EzPaycheck". 3. 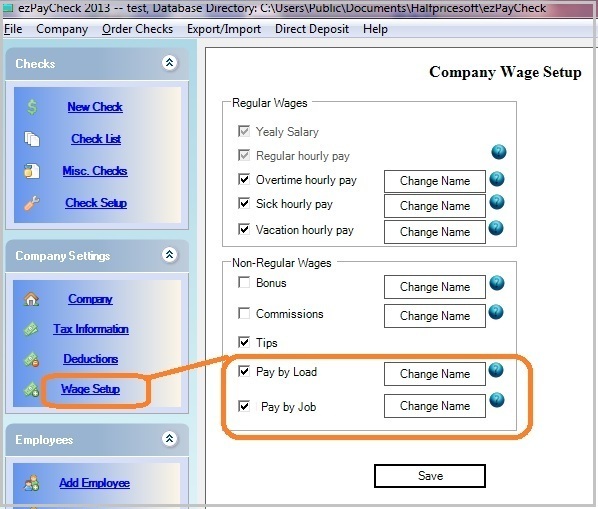 Select ezPaycheck accounts and import W2 forms or 1099 forms. After President Barack Obama signed the tax rate changes into law, IRS released the new updated income-tax withholding tables for 2013 on Jan 3. The revised withholding tables show the new rates in effect for 2013 and supersede the tables published on Dec 31, 2012. For 2013, the employee tax rate for social security increases to 6.2%. The social security wage base limit increases to $113,700. According to IRS, Employers should implement the 2013 revised withholding tables and new Social Security tax rate as soon as possible, but no later than February 15, 2013. 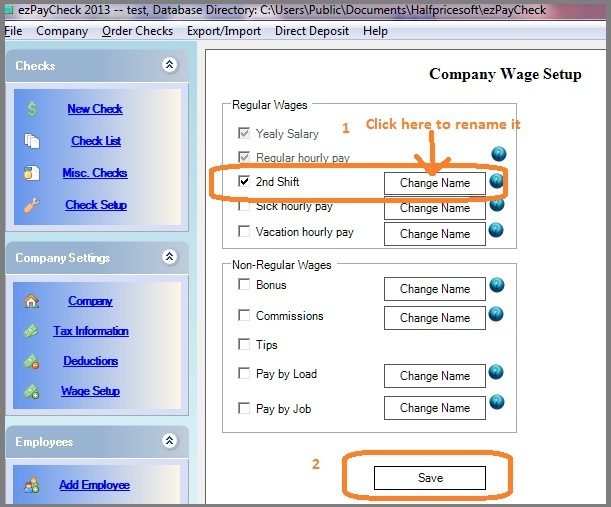 We have updated ezPaycheck 2013 payroll software for this change.